The Brunswick School seniors, posing with their coaches, celebrated Senior Day with a 63-38 win over visiting Masters School at Dann Gymnasium on Wednesday. Brunswick School’s basketball team certainly celebrated Senior Day in style. The Bruins upended visiting FAA foe Masters School, 63-38, on Senior Day in Dann Gym on Wednesday. The 25-point win was the largest margin of victory for the Bruins this year, they posted a 64-35 win over Hopkins back on Jan. 6, 2018. Trailing 12-7 at the 9:45 mark of the first half, Brunswick (5-14, 4-9) went on a 17-8 run to take the lead at 24-20 with 3:25 left in the frame. The Bruins took a 28-24 lead into the intermission. Brunswick responding with a game-changing 19-2 run, to build a 47-30 advantage by the midway point of the second half. By the 5:34 mark, the Panthers cut the deficit to 47-36 with a 6-0 counter, but Brunswick outscored the visitors 16-2 down the stretch for the decisive home-finale win. Colin Mulshine led the Bruins with a game-high 16 points, as Chisom Okpara added 14 points. It was the final regular-season home game for seniors Charlie Wall (six points) Charlie Marvin (five points), Ryan Mulshine (two points), co-captain Will Prout and Ben Burns. The Bruins wrap-up their regular-season schedule with a Valentine’s Day showdown at Greens Farms on Thursday. They will then wait to see if they earned a berth in next week’s FAA Tournament. Greenwich Academy was defeated by visiting Hackley School in its final game of the regular season on Wednesday, 53-29. The Gators entered halftime facing a 26-15 deficit. Junior guard Francesca Sileo scored 12 points to lead Greenwich Academy (5-14). Sileo converted two 3-pointers for GA, which received nine points from senior forward Olivia Davis, who fouled out of the game early in the second half. 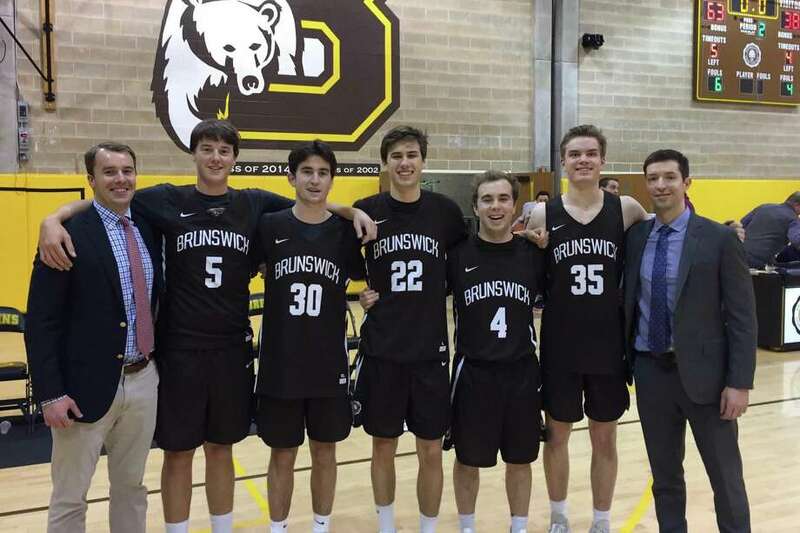 Greenwich Academy, which celebrated Senior Day on Wednesday, turns its attention to the FAA basketball tournament, which starts Tuesday. The Gators will be on the road during the tourney.